Looking for a Custom Boat Mattress? Click Here! A good night’s sleep is priceless, and a good marine mattress might help you sleep better when you are on your boat. If you are looking to purchase a new boat mattress, look no further than Replacement-Mattress.com. A memory foam boat mattress is a great option for a boat because they are easy to put in place and less expensive than a latex mattress. Not to mention, innerspring mattresses are difficult to install in a boat and are pricey when manufacturing custom sizes, so a foam mattress is the best option. It is important to correctly measure the space where the mattress will sit. Measure the inside of the frame where the replacement mattress will be placed. Round your measurements down to the nearest lower inch. If you have a cut corner marine mattress, measure where the mattress goes, never measure the old boat mattress. Our company can create a custom mattress for v berth in boat mattress boxes or manufacture a more traditionally-shaped mattress. We manufacture a variety of mattress shapes for many brands of watercraft. Find the mattress shape that best suits your needs, and measure where the mattress goes. The following shapes can easily be ordered online here. 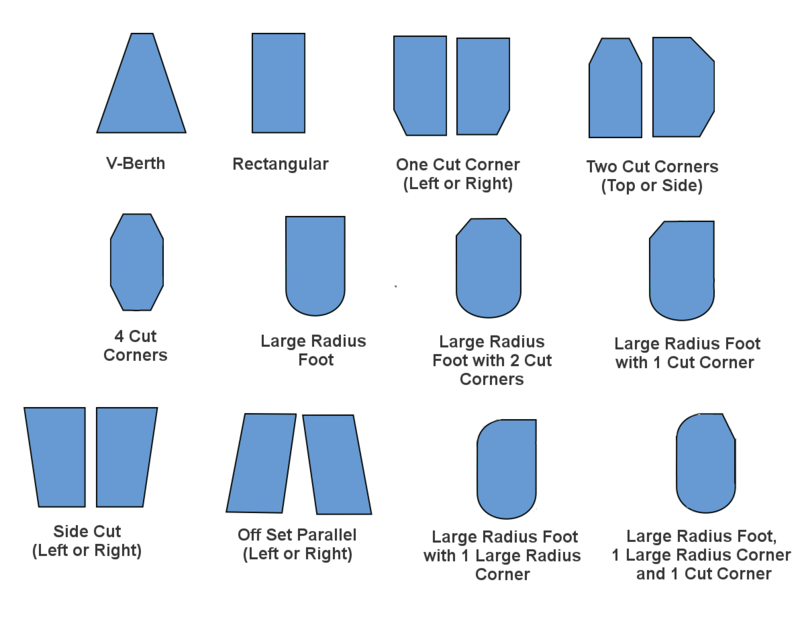 For the following shapes, please submit the custom mattress order form. Our company creates custom boat mattress shapes for all types of boat and yacht brands. We manufacture mattresses for Sea Rays, Bayliners, Mastercraft, Baja, Boston Whaler, Ranger, Malilbu, Chaparral, Wellcraft, and Grady-White, Sunseeker, Princess, Aegean, Hatteras, Tiara, Pursuit, Yamaha and more! It is not surprising that boat interiors are frequently moist from being on the water all day. Sometimes the moisture becomes trapped between the mattress and platform, which could lead to mold or mildew. To help avoid problems with mold and mildew, add a layer of polyester batting to the bottom of the foam, and air out the mattress outside every couple of days. Do not remove the covers. The sun will naturally dry and freshen the mattress. Another idea is to store your mattress vertically in the aisle when you are not using your boat so it will stay dry and the base can dry out. Furthermore, when your boat is docked, sprinkle anti-fungal powder on the bottom of the mattress, as well as on the platform where the mattress usually sits.